The international broker InstaForex became the official Gold Sponsor of the ninth exhibition Forex & Investments Summit held on November 15-16 in Abu Dhabi. The status Gold Sponsor is an honor as well as a responsibility for InstaForex, because a high status of the exhibition Forex & Investments Summit is acknowledged by all participants of the financial market. We are glad that the organizers of the expo Forex & Investments Summit and the international broker InstaForex became partners arranging this event. Forex & Investments Summit is one of the most recognized financial exhibitions in the world. Annually Forex & Investments Summit gathers leading representatives of the financial sector around the globe. Traditionally, the majority of participants and guests of the expo will be representing currency and other investment markets. At the exhibition Forex & Investments Summit awards in 19 categories will be handed in, including such as "Best Forex Broker", "Best PAMM Broker", "Best Retail Broker" etc. We invite guests related to financial markets to visit this remarkable event, that will be of interest to all of you. 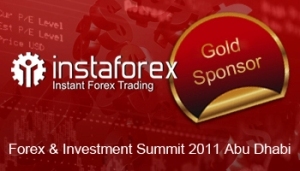 InstaForex и Forex & Investments Summit 2011 are looking forward to see you! Last edited by IFXYana; 04-11-2011 at 14:05.